This paddock is highly variable in topsoil texture, ranging from medium sands to buckshot clays. There is a high level of correlation between the CEC and fuel usage map (i.e. heavier soil types burn more fuel to till). The ‘stripeyness’ in the fuel map is an elevation effect (i.e. using more fuel going uphill, less going down). These maps work well in conjunction with one another as the fuel usage map gives you a high level of resolution (18m seeder swaths), while the CEC map gives you real numbers to work with. 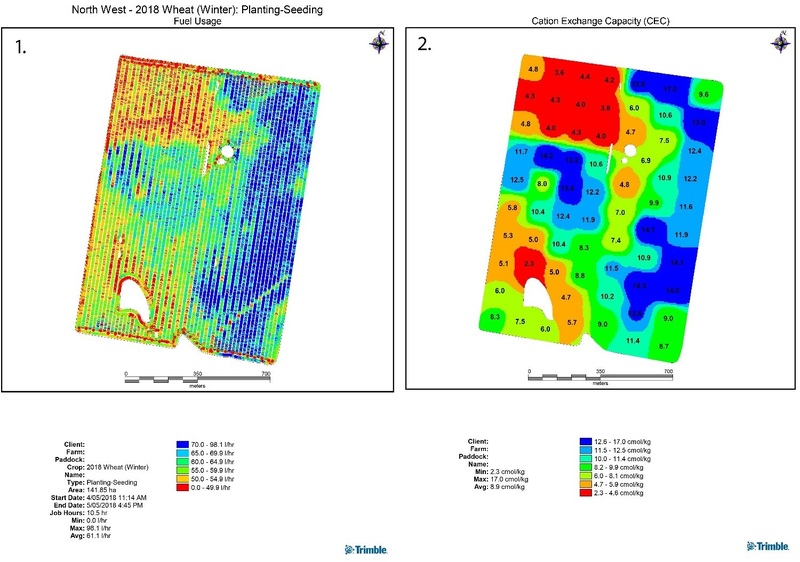 These maps can be combined to develop management zones (in addition to yield data, elevation and NDVI imagery) to inform variable rate applications, such as gypsum or manures. pH (CaCl2) was also analysed at the same time as CEC which gave us another useful data layer for variable rate lime. The great thing about the fuel usage maps is that many growers would already be collecting this information at no extra cost, much like elevation data. Click here to find out more about Eva and her work with FarmLink.